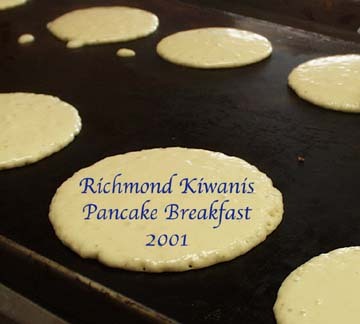 Richmond Kiwanis hold successful 2001 Pancake Breakfast. 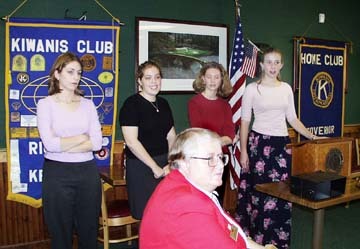 Dr. Steffen Wilson, adviser to the team of honors students introduced the students to the Richmond Kiwanis Club who gave a presentation they had previously made at a national honor's conference. Dr. Wilson, a professor in the Department of Psychology at EKU, introduced each of the four speakers. Tish Kabalen, a senior studying to become a physician's assistant, presented basic data on the impact of media on the violence of children. She cited examples of children who, with disastrous results, replicated situations they had seen on television. She noted that while it was recommended that children watch no more than 2 hours of television per day that the national average for children is twice that amount. While they watch this amount of television they are exposed to 8,000 murders and 100,000 acts of violence in one year of television watching. Most of the television watching they do is between 6 and 9 p.m. - during that time slot they are likely to see 497 acts of violence in a week. 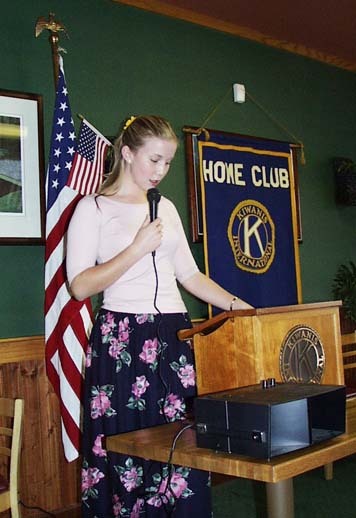 Sara McCane, a senior psychology and Spanish major who is quite active with the Boys and Girls clubs of Madison County, said that viewing violent acts makes children more willing to tolerate violence. "Seeing violence on television every day gives children a world view of violence," she said. "This," she said, "makes it more difficult for children to distinguish between what is and what is not violence." Kristy Northcutt, a senior Spanish major who is applying for the Journeyman's Program, said that video game can make children even less sensitive to violence. She added that first person video violence, rather than passively watching violence on television, makes individuals even more aggressive. The substitution of large realist guns rather than joy sticks makes the effect of violence even more realistic. 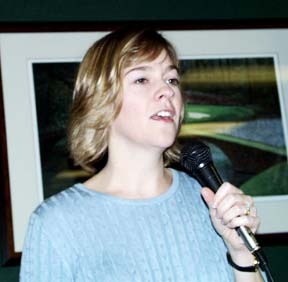 She noted that the participants in the Columbine High School shootings were heavy game players - especially the game Dune. The final presenter was Annie Williams a senior education major who plans to become a kindergarten teacher. Williams said it was important for parents to engage children in conversation about the difference between real and simulated violence. Furthermore, she said, parents need to be role models. One of the difficulty with game playing, said Williams, is that in games characters have multiple lives. She said some children don't seem to make the distinction between real and virtual life. Dr. Bonnie Gray, director of the EKU Honors Program attended the Kiwanis meeting to hear the students make their presentation. Dr.Bonnie Gray is in the foreground while the presenters fielded questions after their formal presentation. Dr. Robert Grise, a retired professor of education at Eastern Kentucky University and curator of the Granny Richardson Spring School, gave an overview of the importance of one-room schools in history of EKU, of Madison County and of Kentucky. Dr. Grise said Eastern Kentucky University owes its existance to the one-room school because when it was initially started in 1906 as the Eastern Kentucky State Normal School. 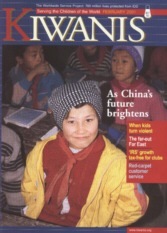 The purpose of the normal school was to train teachers to teach in one-room schools. Two normal schools were created at that time in the same Normal School Bill (HB 112), introduced by Representative Richard W. Miller of Richmond. He said School Number 1 was located in Richmond and School Number 2 (provided for in the second paragraph of the act) established what later became Western Kentucky University. He jokingly pointed out that EKU is accordingly older than WKU. He said a one-room school could be created as long as at least 45 students lived in the area served by the school. He said it was uncommon for more than about two-thirds of that number to actually attend school - unlike today when more than 95% attend school. He said these schools were often run by three trustees - often a farmer, businessman and preacher. He said teachers generally viewed these trustees as misers. He said that during the 1920s there were 120 one-room schools in Madison County. 100 of these were for white children and 20 were for black children. He said in 1925 two EKU professors (Jones and Jaggers) conducted a survey of these county schools and discovered that of the 119 one-room schools at that time only three had playground equipment. He said a homemade bat and a ball made of would string plus a basketball goal which consisted of a bushel basket with the bottom broken out qualified for the playground equipment of one of those schools. He said teachers had to go yearly to the superintendent's office to take an exam which qualified them to teach. If they scored 70% on the exam they were given a one-year contract. If they scored 80% on the exam they were given a two-year contract. And if they scored 90% on the exam they were given a four-year contract. If, however, they crossed county lines they would have to seek a new teaching certificate. Dr. Grise said the Granny Richardson Spring School was originally located in Estill County and was a very prosperous school in 1915 when oil was discovered on school property. When oil dried up they used an acid treatment to try to float oil so they could remove more. Not only did this not work, but it contaminated the school spring. By 1950 the school was down to 13 students, bhy 1963 they had 6 people in 8 grades and it closed at the end of the 1963-64 school year. For a period of time it was a residence and later a barn. 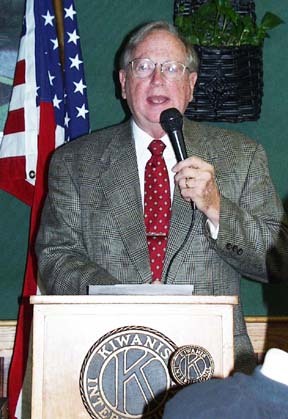 In 1975 Dr. Robert R. Martin, president of EKU and former Kentucky Superintendent of Public Instruction, obtained the school and had it moved to campus. At that time the Lee County Superintedent of Schools Elbert Hudson (currently a Richmond Kiwanian) provided a period globe and a picture of George Washington to be used in the school. 7. Since there is no time like the present, he thought it was to time to present the present. 12. There was a row among the oarsmen about how to row. 13. They were too close to the door to close it. 14. The buck does funny things when the does are present. 15. A seamstress and a sewer fell down into a sewer line. 17. The wind was too strong to wind the sail. 19. Upon seeing the tear in the painting, I shed a tear. The Wellness on Wheels Wagon (WOW), one of the many projects supported by the Richmond Kiwanis, distributes health information to youth and schools in the Madison County Area. See here is Phyllis Adams, Richmond Kiwanis member, who is seen providing information at the Berea Spoonbread Festival. The wagon was also provided information to youth at the Kiwanis Carnival.